How do I export English Learner information from PowerSchool? 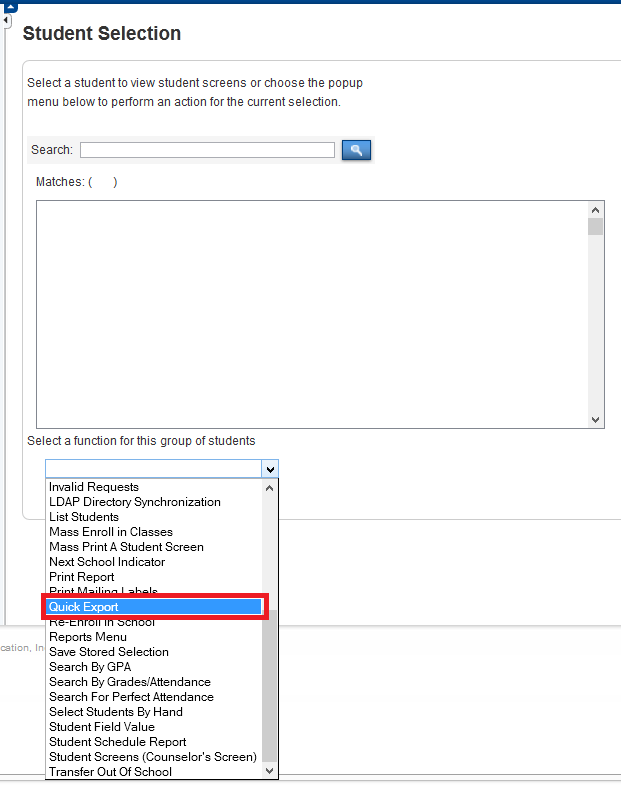 Step 2: Use the Quick Export Function with your custom English Learner Fields code and Submit. CA_ELProfELA = Proficient or advanced on the California English Language Arts Standards Test for three cumulative years after being reclassified/redesignated as fluent English proficient (RFEP). This course section is providing primary language instruction, English Language Development (ELD), and Specially Designed Academic Instruction in English.Primary language instruction is an approach used to teach academic courses in and/or through a primary language other than English. The curriculum must be equivalent to that provided to fluent English proficient (FEP) and English only students. Instruction must be provided by an authorized teacher (either certified or in training for the type of service provided). ELD is an academic subject of English language instruction appropriate for the studentÆs identified level of language proficiency. ELD is consistently implemented and designed to promote second language acquisition of listening, speaking, reading, and writing. ELD instruction must be provided by an authorized teacher (either certified or in training for the type of service provided). SDAIE is an approach used to teach academic courses to English learner (EL) students in English. SDAIE must be designed for non-native speakers of English and focused on increasing the comprehensibility of the academic courses normally provided to FEP and English-only students in the district. SDAIE must be provided by an authorized teacher (either certified or in training for the type of service provided). This course section is providing only English Language Development (ELD) instruction, which is an academic subject of English language instruction appropriate for the studentÆs identified level of language proficiency. ELD is consistently implemented and designed to promote second language acquisition of listening, speaking, reading, and writing. ELD instruction must be provided by an authorized teacher (either certified or in training for the type of service provided). This course section is providing only Specially Designed Academic Instruction in English (SDAIE) services, which is an approach used to teach academic courses to English learner (EL) students in English. SDAIE must be designed for non-native speakers of English and focused on increasing the comprehensibility of the academic courses normally provided to FEP and English-only students in the district. SDAIE must be provided by an authorized teacher (either certified or in training for the type of service provided). The course section is providing English Language Development (ELD) instruction and Specially Designed Academic Instruction in English (SDAIE) but NOT Primary Language Instruction. ELD is an academic subject of English language instruction appropriate for the studentÆs identified level of language proficiency. ELD is consistently implemented and designed to promote second language acquisition of listening, speaking, reading, and writing. ELD instruction must be provided by an authorized teacher (either certified or in training for the type of service provided). SDAIE is an approach used to teach academic courses to English learner (EL) students in English. SDAIE must be designed for non-native speakers of English and focused on increasing the comprehensibility of the academic courses normally provided to FEP and English-only students in the district. SDAIE must be provided by an authorized teacher (either certified or in training for the type of service provided). The course section is NOT providing Primary Language Instruction. CA_ELlt12mos = English Learner in US Public Schools less than 12 mos. CA_BirthCountry = Student Birth Country information needed for First USA Schooling and Immigrant Funding information. CA_FirstUSASchooling = Required if student Birth Country not equal to U.S or Puerto Rico, or if the ELA Status is ‘EL’. CA_ImmigrantFunding = The foreign-born student has been enrolled in one or more public or private schools in the U.S. or Puerto Rico for a cumulative period less than or equal to three full academic years.